We are starting an EMS Post with Jeff State this fall, and they are having their kick-off Open House next Thursday, October 23rd. 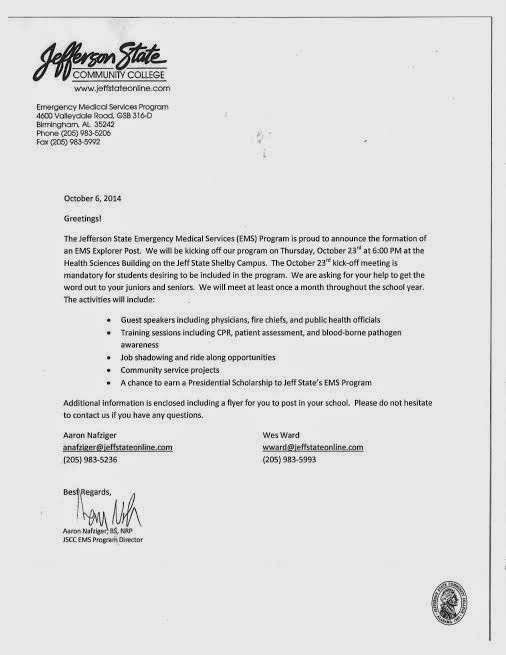 Attached is a flyer and letter with their information – please share it with your great home school network! This will be a tremendous opportunity for students, because in addition to the experience of learning about careers in EMS, Jeff State has committed to awarding one member of the Post a Presidential Scholarship to Jeff State at the end of the school year! One slight change from other Posts that your students should be aware of: at least in this initial year, they want participants to be Juniors or Seniors to be a part of the program. Let me know if you have any questions. Thanks again for your help!